For a country invaded, colonized and now governed by born-again foreigners, the complex issues surrounding immigration and homeland security put thousands of lives in turmoil every day. Jumping the queue and entering the U.S. illegally are just two systemic abuses that result in polar opposite situations. Add to that the overarching fear of terrorists slipping through the fantastically expensive dragnets at every port of entry, the already difficult situation unwittingly frustrates many of the innocent and welcomes a few of the guilty. Oh, for the mythical days of the Wild West when the bad guys were so readily identifiable! Writer/director Tom McCarthy has designed a film that digs deep into the current state of the system. It’s a carefully constructed tale that, in the early going, moves at a magnificent pace as the story unfolds to the magical strains of Beethoven’s “Waldstein” Sonata and the bewitching allure of African drums. 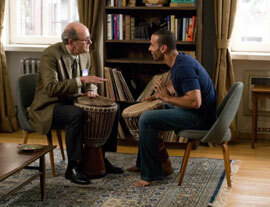 Maddeningly, the script serves up a major gaffe as Syrian drummer extraordinaire Tarek Khalil (played with passion, humour and skill by Haaz Sleiman) gives an early lesson to his unexpected landlord, Professor Walter Vale (Richard Jenkins is note perfect in his dry, bloodless delivery and blossoms inside and out as the plot takes its inevitable course). The illegal explains to his charge that classical music is “all about four” (4/4, 2/4 etc.) and African “all about three.” No truth there as witness the torrents of triplets and triple metres that challenge “serious” pianists in much of the standard repertoire and the closing sequence (where the good Professor can be seen making his Broadway début) that’s exclusively duple. That aside, when the music moves into the background and the woes of being arrested for no good reason (an apparent subway fare violation by Tarek after the marvellous drum circle sequence in Central Park) only to be discovered as an illegal immigrant and immediately incarcerated in a big box detention centre in Queens, the ear is soon hoping for another trip to Jules Live Jazz club or even a flashback to one of Vale’s unsuccessful piano teachers. Rounding out the cast are Tarek’s jewellery-making love, Zainab (Danai Jekesai Gurira is resplendent as the Senegalese refugee who dare not visit her man or risk joining him back on the road to deportation) and his long-suffering mother (Hiam Abbass, appropriately stoic and understanding as required). Clearly, the newcomers cast a mighty spell on the empty academic (the death of his concert-pianist wife has driven the Connecticut teacher into the empty world of lessons by rote and surrogate publications—not coincidentally in the field of global economics) and use their musical and life-surviving arts to transform the shiest man in the world into a creative spirit not averse to practising his percussion skills in his underwear.